That Bastille Cafe Rectangular Dining Table is an iconic re-imagination of Jean Prouve's well-known EM Table from the early 1950's. Making its debut, the design became defined by its unique base. Creating a symmetrical, industrial look, this signature look is still sought after to this day. The Bastille Cafe Rectangular Dining Table is inspired by Jean Prouve's iconic EM Table, which debuted in the early 1950's as part of a prefab housing project in France, called "Maison Tropique". The EM Table was defined by a uniquely styled base consisting of four tapered steel legs which were angled slightly outward to create a symmetrical yet juxtaposed stance, connected by tubed steel. The industrial styling of the legs is an element that Prouve adapted to other pieces, and has become a signature element in his works. 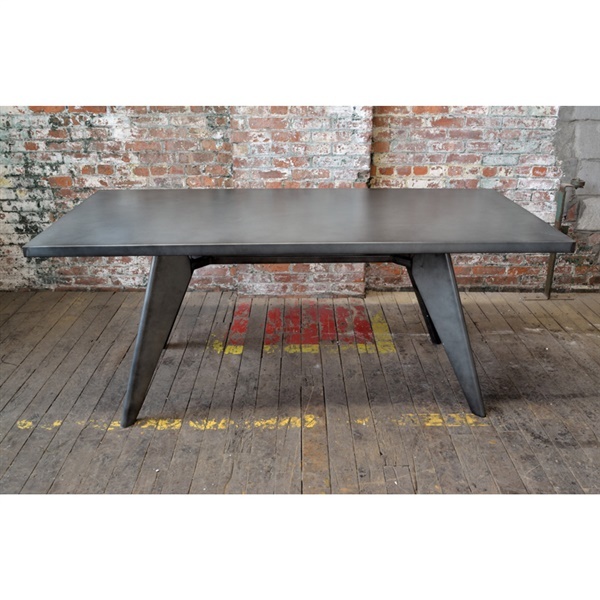 The Bastille Cafe Rectangular Dining Table has a galvanized steel frame & top that preserves the balance of form defined by the original EM Table. Abrasion detail and surface markings create a chic worn-industrial look, and a zinc finish is applied for rust resistance. The Bastille is well-prepared to accommodate your guests and functions just as well as a desk in your office or home office. This table was the perfect size for my condo...not too tiny, but not too big for a smaller dining area. Love the design, sturdiness and finish. It's very distinctive and not an average looking table. My only complaint is that it took about two hours to assemble. The last screws to screw in were not lining up; there was over an inch difference between the holes in the bracket on the leg piece and the holes on the table. I tried switching the legs, but it didn't help. I thought I was going to have to return it. I ended up having to really force it in place...so basically bending the metal somewhat. I was afraid I was going to break it, but I finally got the last screws in place. Don't know if this was a rare fluke, or if such force is always needed to assemble the table. ConsForce was needed to make the last screws line up with the holes they were to go in. mild sheen - bright and beautiful! Sleek style with a mild sheen to it, this table looks bright and beautiful under the right lighting! FANTASTIC dining room table!! perhaps not the best choice with kids running around, angled edges make for a stunning design but i didn't realize how much anxiety it gave me everytime my 7 year old ran by it! I am sure this would make a fantastic dining table but we decided to use it as a meeting table in our conference room and combined with the bastille chairs we ordered with it - amazing choice!! Seriously, if you are going for that industrial chic look this is the place to go! Thanks a bunch! Table looks awesome with a set of industrial style chairs I ordered from you guys a while back in a gunmetal finish, a great match! 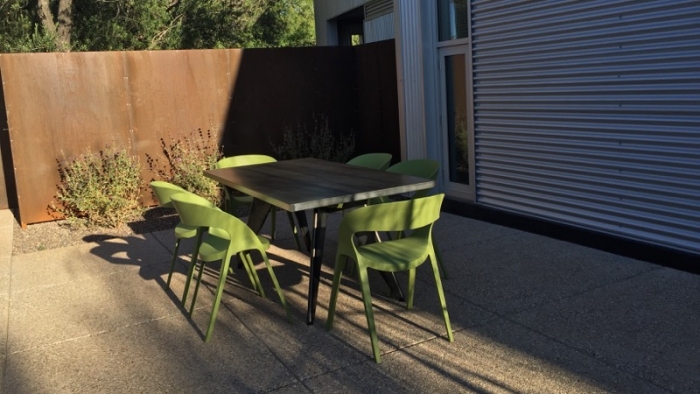 I ordered this table with the bastille stacking arm chairs, it is a brilliant combination! I love the design of the legs on the table, ultra spacious and a well-make. Thank you! Received out Bastille Cafe table and it looks amazing. It came well packaged and was easy to put together (took about 20 minutes). Table is the perfect size and look for our loft. This table is by far my favorite Inmod piece. It's super durable and the industrial look is perfect. Easy checkout and it shipped really quick. Arrived with no damage. ProsSolid table. Arrived in perfect condition. Loved it so much at my first place I bought another when I moved! I received my dining table yesterday and I am very happy with it so far. It did arrive with a small dent on top but it's nothing I can't live with. The table was very easy to assemble. We really like how it looks in our out door space. Be aware that the description does not mention that it has black paint misted over the whole thing. After receiving it and then going back to the photos on the Inmod web page you can pick it out. Some of the photos look like there is no paint. The amount of black paint on ours is significantly more than shown in the Inmod web page photos. It has a nice sturdy feel, comfortable to sit at, and there are adjustable feet in case your surface is not level. Easy to assemble....I would recommend to anyone! What are the dimensions of the legs - for example, what is the width between the legs on the long sides and the short sides? How about the height from under the table to the floor? I am trying to figure out if my Arco chairs will slide underneath the table, and if so, how many can fit. Thank you for your help! Unfortunately, this item has been discontinued, and is no longer a part of our offerings. I apologize for the inconvenience. It can be cleaned with a damp, clean cloth and a mixture of water and mild soap. It will then need to be wiped dry. Can the 58inch table seat 6 people comfortably? The 58 inch size will seat 6 people. Comfortable or tight seating space will depend on the size chairs used with the table. Can this table be used outdoors? What is the material? Will it rust in the rain? Our Bastille Cafe Rectangular Dining Table is made to be for indoor and outdoor use. It is made with dark galvanized steel which is made to withstand the elements. The Bastille Cafe Rectangular Dining Table weighs 83 pounds.